Nothing says you are valued like sending out heartfelt greeting cards to those who matter most. 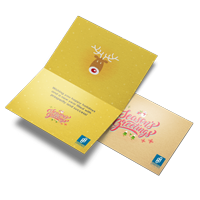 Give printable greeting cards to your loyal customers and important prospects. This affordable solution to market your business will also bring cheer and goodwill. Custom greeting cards are perfect not just for holidays but also for birthdays, graduations, or any other milestones that call for a celebration. It’s a good direct marketing strategy for promoting sales or discounts, but also to tell your customers you are thinking of them. More space for your message, artwork, photos, or personalized notes. Since these are folded, they offer double the space compared to flat cards. 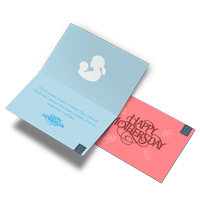 To enclose other items such as cash, gift certificates, tickets, and magnets in your card. To use envelopes to send these out. The envelopes protect your card from dirt and tears. Sticker seals are needed if you don’t want to use an envelope. A more modern, edgy look. A hassle-free way of mailing them out. These can be sent without envelopes or sticker seals. 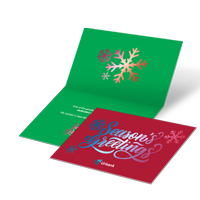 A cost-effective greeting card printing solution for the holidays. Custom greeting cards let you create the card you want, your way. For a more premium feel, get silk greeting cards. The silky-smooth texture exudes elegance and luxury. For a brighter, festive shine, go with metallic greeting cards. The added sparkle draws more attention to your warm greetings. PrintPlace offers a wide range of paper stocks such as gloss, matte or uncoated. With sizes ranging from the standard 4.25” x 6” to as large as 12” x 6” (folded to 6” x 6”), you’ll never run out of options. When your artwork is ready, just upload it to our website and get your greeting cards in no time.